The Casino was established in 1997 and has since provided punters with some of the most incredible slots and other Casino games from Playtech. The Casino is owned by Peak Interactive N.V Casinos and licensed by the government of Curacao. Having been in operation for more than two decades, Omni Casino has witnessed a range of changes and adjustments in the quest to improve the player’s experience at the Casino. 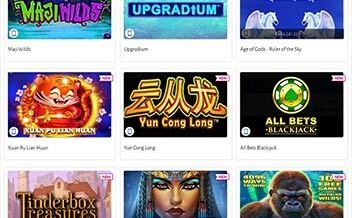 The Casino offers a huge library of online slots and other games, superior graphics, and Live-chat support. Indifferent to other Casinos, Omni Casino offers players with amazing bonuses and promotions in a bid to usher new players into the Casino as well as keep the existing ones enticed. The Casino’s welcome bonus features 100% match up to $300 on the first deposit, 75% match up to $400 for the second deposit, 50% match up to $500 for the third deposit, and 50% bonus match up to $800 plus 100 free mega spins for the fourth deposit. 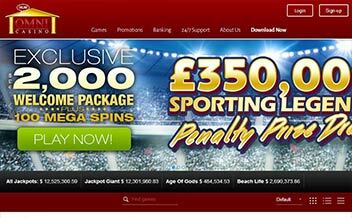 To withdraw the bonus and any winnings from it, the player must wager the amount at least 25 times. 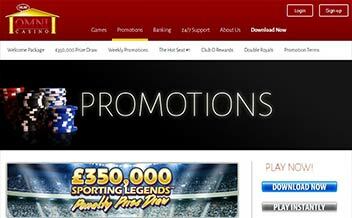 Existing players can also take advantage of the different promotions that are made available throughout the month. Omni Casino has a huge library of slot games that are made available by the Casino’s sole software developers, Playtech. Some of the popular titles include Iron Man II, The Incredible Hulk, Desert Treasure, and X Men. Table game fans are not left behind either. The Casino has a multitude of table games that are tailored to meet the dynamic needs of the diverse client base. Some of these games include Blackjack variants, Roulette variants, Baccarat variants, and several others. The Casino also has some of the most incredible video poker game offerings from Playtech. The games are tailor-made to ensure that players can enjoy them regardless of the size of the pocket. Some of the games include Jacks or Better, Deuces Wild, Coliseum Poker, and Aces and Eights. The Casino is powered by the renowned Playtech, which is responsible for all the gaming developments in the Casino. The software for download and instant play customers and features one of the richest libraries of thrilling slots and games. The Casino holds a Certificate of Trust and the software is vetted for fair play by TST. The United Kingdom, the United States, Italy, Turkey, Spain, Philippines, the Netherlands, Serbia, Syria, France, Israel, Hong Kong, Estonia, Cuba, Curacao, Cyprus, Bulgaria, and various others. Maestro, Neteller, UseMyBank, Skrill, Trustly, Visa, Paysafe Card, Internet Banking, Diners Club International, GiroPay, Visa Electron, Ukash, Solo, MyCitadel, Master Card, Switch, among others. 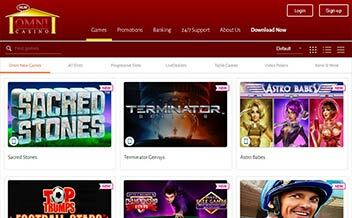 Omni Casino features downloadable and instant play platforms for all players. Players can enjoy the rich library of slots and games without having to download files necessarily. The Casino also runs on major web browsers like Chrome, Mozilla, Internet Explorer, and Opera. The Casino’s software is SSL encrypted and vetted for fairness by TST. Omni Casino features one of the longest standing offshore Casinos. The Casino has an outstanding reputation, huge library of games, hefty welcome bonus, and amazing graphics for the different slots and games. Recommended!